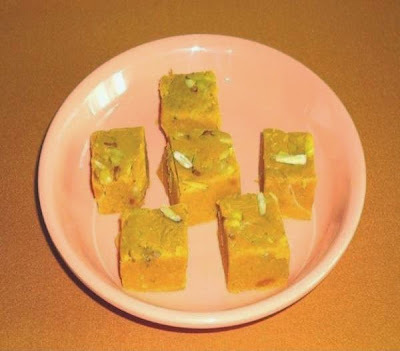 Mango burfi using pedha recipe - Mango burfi is my favorite sweet dish. There are so many varieties of burfis available in the sweet shop. But home made is always best as we combine the ingredients as per our choice to suit the taste. Usually I make burfis using khawa or mawa. 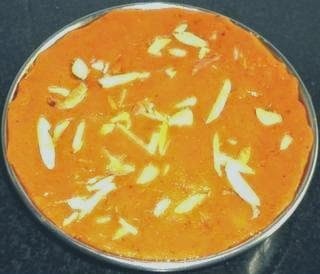 But I made this burfi using pedha for a special reason. Our family friend Milind and Bhavana's daughter Shreya scored 95% in 10th std. CBSE Board. Congratulations Shreya!! 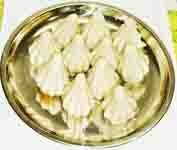 They came to visit us with a boxful of chitale bandhu's famous rajkot pedha. Thank you Milind and Bhavana for so much love and affection. 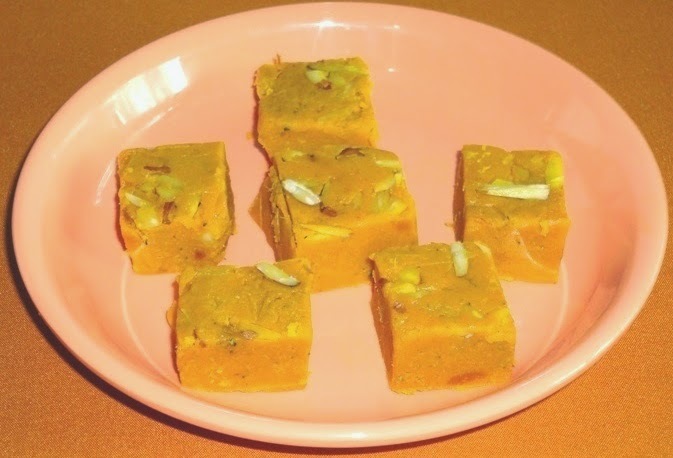 We ate few pedhas and I used some of them to make this lovely soft and delicious mango burfi. You can add up some soaked cashew nut paste to the mango pulp to make it rich and creamy. Heat the ghee in a pan on a low flame. Add crumbled pedha in it. 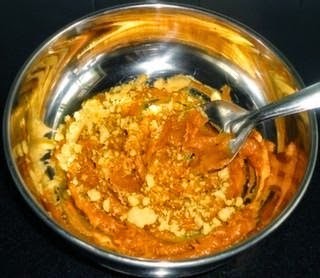 Stir for about 5 minutes or till the pedha mixture becomes slightly sticky. Then add the mango pulp and sugar. Cook stirring continuously till the mango pulp turns sticky and thick. 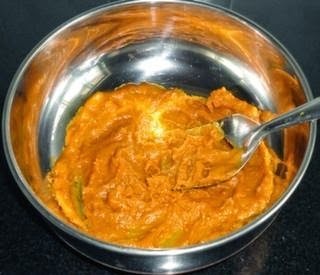 To test the mixture, take a small portion of the mango mixture and roll it like a laddoo. If it can be rolled, the mixture is ready. Remove from the fire. Add cardamoms. Mix well. 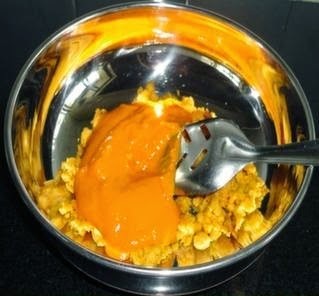 Grease a plate and spread the mixture on it. Spread the sliced almonds and pistachios all over the mixture and press gently.Allow it to cool. When the mixture cools, cut the burfi into squares. Keep it in the refrigerator for half an hour. Allow it to dry. Remove and serve the mango barfi. 2. Heat the ghee in a pan on a low flame. Add crumbled pedha in it. Stir for about 5 minutes or till the pedha mixture becomes slightly sticky. 3. Then add the mango pulp and sugar. 4. 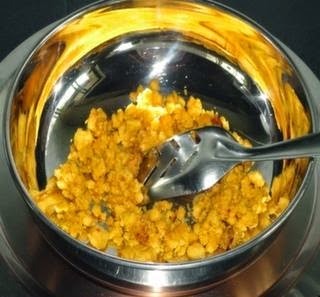 Stir to combine the mango pulp and crumbled pedha. 5. Cook it on low flame stirring continuously till the mango pulp turns sticky and thick. 6. Test the mixture, take a small portion of the mango mixture and roll it like a laddoo. 7. If it can be rolled, the mixture is ready. Turn off the flame. Add cardamom powder and mix well. 8. Grease a plate and spread the mixture on it. Spread the sliced almonds and pistachios all over the mixture and press gently. Allow it to cool. 9. When the mixture cools, cut the burfi into squares. Keep it in the refrigerator for half an hour. 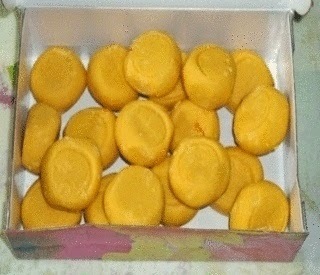 Remove and serve the mango barfi. Vidya, pass me a slice. wow, very interesting and innovative recipe. Love the color. That sounds really yum Vidya :) I will try it them out sometime. wow! mouthwatering burfi. Love it. super yummy burfi, timely recipe!! !